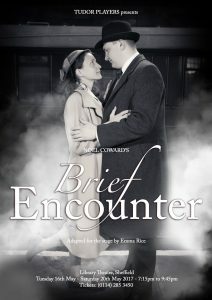 ***** Although I have never seen the film of Brief Encounter, I know so many references from the it that I feel like I do, so I was delighted to be in the audience for the opening night for the Tudor Players 50th anniversary year production of the Noel Coward classic, adapted for stage by Emma Rice. Brief Encounter tells the classic love story of Laura Jesson and Dr. Alec Harvey who meet accidentally in the Milford Junction refreshment room while waiting for their respective trains when Alec helps Laura remove a piece of grit from her eye. Over the course of a few weeks seeing each other only on Thursdays, Laura and Alec fall in love. The problem is that each is already happily married with a family, and neither wants to hurt their own spouse. As Laura tries unsuccessfully to avoid meeting up with Alec as her emotional need to see him takes over, they have to decide how to deal with what looks to be a doomed but life long romance with each other, while hiding their encounters from anyone, especially their friends and acquaintances who may see them together in Milford. Adapted by Emma Rice for Kneehigh Theatre Company, the play features inventive humour, imaginative staging and, of course, memorable Noel Coward songs and has been performed across the globe, and now in Sheffield. The Tudor Players production is produced and directed by Phil Gascoyne and Roger Bingham with musical direction by Jill and Steve Hepple and featuring a cast of 21 actors, including eight new members, with Francesca Rooker and Marcus Newman in the lead roles as Laura and Alec. I highly recommend that audience members arrive at the theatre as early as possible in order to make the most of being welcomed by theatre usherettes in traditional costumes and to enjoy a series of Noel Coward and 1930s musical classics, alongside comedy monologues, performed beautifully on stage by members of the ensemble, including “Smoke Gets In Your Eyes”, “Sing” and “Goodnight Sweetheart”. By far the best adaption of a play I have seen from this era that made me desperate to see more Noel Coward and witness some old fashioned romance, Brief Encounter began with the black and white opening credits on a big screen and Alec and Laura having a passionate discussion in the front row, watched on by the audience and an usherette, whilst Laura’s husband pleaded from the screen in film noir style before film and theatre merged. The screen continued to be cleverly used throughout the performance, alongside a simple but very effective set, to capture the setting, time and emotion of the play and delivery the memorable and all important final line “You’ve been a long way away, thank you for coming back to me”. Brilliantly cast, Francesca and Marcus were the incredible stars of the show, with their faultless acting, accents and posture perfectly capturing the era and their romantic chemistry, how ever much they tried to restrain it, could be felt by the entire audience and whose portrayals could almost have stepped right out of the original film. From their meet-cute (a classic Hollywood term) of Alec helping Laura get grit out of her eye via the boathouse scene where they declared their love and had their first kiss packed with passion and desire, to their final moment in the cafe that proved love would be far easier if their were only two people involved and no interactions, their love story came alive on stage. This love story is not all about Laura and Alec, with Charlie Russell as Beryl Walters, who I can best describe as a cockney Zoey Deschanel opposite her love interest Josh Cooper as Stanley Dean who would make an excellent cockney Buttons and whose romance reflected the sweetness of young love; and Edwina Gascoyne as cafe owner Myrtle Bagot and John Fereday as Station Manager Albert Godby whose more mature young love was Carry On meets seaside postcard. Other cast members requiring a well deserved mention include Peter Crown as Laura’s husband Fred who perfectly captured the apparently unobservant but loving husband/father role of the time and although it was clear to see he loved her and their daughters also helped explained why she was drawn to Alec; Pam Bush as the waitress channeling her inner Julie Walters from Acorn Antiques; and Thea Salt-Bush and Esme-Salt Bush as Laura and Fred’s young daughters Margaret and Bobbie (played by Holly-Ann Waterhouse and Lily-Mae Norman on Wednesday and Friday) who played their roles with childlike sweetness and joy as if they were acting opposite their own parents. The stunning musical interludes between scenes captured the various stages of love whilst the crisp harmonies of the ensemble captured the formality of the era. Full of beautiful songs, many of which I sadly do not know the names of, stand out musical performances included Charlie’s performance of “Mad About The Boy” sung and performed with a stunningly seductive, West End worthy cabaret voice; and Josh Cooper and Edwina Gascoyne’s incredible singing voices in “Go Slow Jack” would have made Noel Coward himself proud; and Marcus’s solo number in the closed cafe that was packed with so much emotion that I could feel myself verging on tears just listening to it. Tudor Players, named after Tudor Way where the Library Theatre is located, present three full length plays a year with Brief Encounter on until 20 May being their second, with the third production being the Sheffield amateur premier of the uplifting and moving Second World War story by Michelle Magorian, Goodnight Mister Tom, from 17 to 21 October. Tickets for both shows, all performed at Sheffield Library Theatre at 7.15pm, are £9 (£8 for concessions) each and are available by email at tickets@tudorplayers.net, by telephone on 0114 285 3450 or by writing to 10 Eastwood, Sheffield S6 1TU. P.S. I try not to get political in my reviews but if you love Sheffield Library Theatre and would love the Tudor Players to keep being able to perform their please sign the petition at the box office of the Sheffield Library Theatre.